Easter in the Greek Orthodox calendar falls a week later this year than Western celebrations. 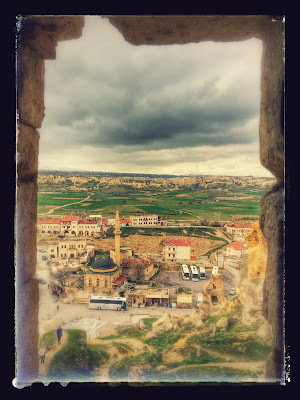 Today [10 April 2015] is Good Friday in the Greek calendar, and I thought of the lost and forgotten Greeks of Cappadocia today when I visited the small village of Çavuşin, about halfway between Göreme and Avanos. Almost a century ago, most of the people living in Çavuşin were Greek-speaking, Christian Orthodox families, living in houses which were cut into a massive rock wall. Many guidebooks say the old village was abandoned several decades ago because of rock falls. The truth is most of the people in Çavuşin were forced to leave their hillside homes in the mass expulsions that are referred to today politely as the population exchange between Turkey and Greece. Çavuşin looks like many an old Greek village. But outside and inside, many of the houses were exposed to hundreds and hundreds of years of weathering and erosion. Today, they are covered in rubble, rocks and boulders, with many of their walls and doors crumbling. I climbed the narrow winding path that brought me to the top of the village. Below me I could see the modern village, now populated exclusively by Turks, and I could see too the spectacular fairy chimneys that are part of the landscape of Cappadocia. The modern village of Çavuşin is still a quiet place, disturbed intermittently during the day with the arrival of tour buses. At the top of my climb, I crossed a shaky footbridge and reached the upper church or the Church of Saint John the Baptist, probably one of the oldest and largest cave churches in the region, and dating back to the 5th century. This old church once had three entrances leading to three now almost separate naves. Its cathedral-like proportions are astounding, and this may be the biggest cave church in Cappadocia. In the past, these three naves were separated only by huge columns, but the spaces between are now filled with stone and rubble, perhaps because of the danger of the building collapsing. The framed doors and windows of two naves are still in place while the rock enclosing the third nave has collapsed. Inside, most of the frescoes are faded by smoke but some are still visible. There are elaborate mouldings, columns and arches as well as reliefs with crosses and stars, in a style more similar to Syrian church architecture than Byzantine styles. The church was once famed for holding a relic of Saint Hieron, a local saint. When he was martyred, his severed hand was sent back to his mother in Çavuşin, and was later kept in a votive shrine. Çavuşin has a second, lower church outside the village and near the main road: Nicephoras Phocas Church, often known simply as Çavuşin Church. This church dates from ca 964/965 and commemorates a visit to Çavuşin by Nicephoras Phocas II, a famous Cappadocian general who wanted to become a monk in Mount Athos but instead became the Byzantine Emperor. The church was once bigger than it is today. The visible frescoes show that the narthex was once enclosed, but it is now open to the elements because of rock falls. The main church has a barrel-vaulted, high nave and three apses. The complex also includes eight to10 rooms on at least three levels. Inside, the frescoes depict the Annunciation, the Visitation, the Proof of the Virgin, the Flight into Egypt, Joseph’s Dream, the Blessing and Mission of the Apostles, the Adoration of the Magi, the Massacre of the Innocents, the Pursuit of Elizabeth, and the Killing of Zacharias; on the west wall, the Entry into Jerusalem, the Raising of Lazarus, the Healing of the Blind Man, the Descent from the Cross, the Women at the Tomb; on the wall of the apse the Transfiguration; and on the north apse the Emperor Nicephoras Phocas and his family. The only prayers most visitors to Çavuşin might have heard today were the Friday prayers in the two mosques, one at the base of the pathway leading up to the Upper Church, the other a modern building in the new village. But back up in Saint John’s I had left a priest celebrating Mass for a small group of Spanish pilgrims. I wondered whether they knew today would have been Good Friday for most of the former residents of Çavuşin? None of the old Greek-speaking villagers, or their children or grandchildren, are coming back to Çavuşin on Sunday for Easter Day. This was never supposed to be an adventure holiday. I wanted to see the rock-hewn churches and monasteries of Cappadocia, the pre-iconoclast frescoes in the Byzantine churches, and some of the sites associated with the Cappadocian Fathers, the three great Patristic figures whose thinking contributed to the Chalcedonian formulations of the Christian faith and creed. If plans worked out, perhaps I might get to see Konya and the shrines of the Mevlevi order of “whirling” dervishes. I had never planned on trekking by a riverbed through a deep mountainous gorge. And although I had pre-booked a trip in a hot-air balloon, that was cancelled on Wednesday morning. I asked about rebooking for Thursday, but was told the weather forecast meant there would be no flights on Thursday, and probably none on Friday. I never bothered to rebook. I have a flight to catch to Istanbul on Saturday [11 April 2015]. Then early this morning [Friday 10 April 2015], before 5 a.m., the reception desk at the Maccan Cave Hotel in Göreme awoke me with a call. Would I like to go on that delayed balloon flight? The bus would be here in five minutes. Before I had a chance to think again, I was up, washed, dressed and waiting. We were registered speedily at the offices of Air Kapadokya, and there were no delays this time. Not even time to finish coffee that was offered as part of the continental breakfast. Three minibuses divided us into three groups, Red, Blue and Green. By the time the Green bus reached the field, many of the balloons were already filled with hot air, the baskets were filling with people. The sun had not risen, the cloud cover seemed to be thickening, but there was a palpable excitement in the air. There were careful instructions for safety and landing. And then within minutes we were air-bound. The balloons rose in clusters of brightly arrayed primary colours – reds, yellows, blues. The towns and villages, the olive groves and farms, the fields and “fairy chimneys,” the valleys and ravines of Cappadocia spread below us, and each burst of hot air into a balloon close by sounded like a thundering wave hitting seashore. The rock formations looked like they were covered in an almond sugar icing, and it times we were so close to them it was tempting to reach out and to try to touch them. We whirled and floated around, rose and fell and rose again, for almost an hour, as the world below us began to wake. And then the slow descent began. The command to brace ourselves was shouted out … 3 … 2 … 1 … we hit the ground in a field beside a small olive grove. We were back on earth. Champagne corks were popped in celebration, slices of cake were handed around. There was an air of celebration around as the balloon was deflated and rolled up. Each passenger was presented with a Flight Certificate. Another adventure had been accomplished successfully, another surprising achievement. And then the snow began to fall. Had the weather forecasters realised those clouds were filled snow? If so, there would have been no hot-air balloon flights today either. Back in the Maccan Cave Hotel on a height above Göreme, large snowflakes were falling softly as we sat down to breakfast. It was only 8.15 a.m.